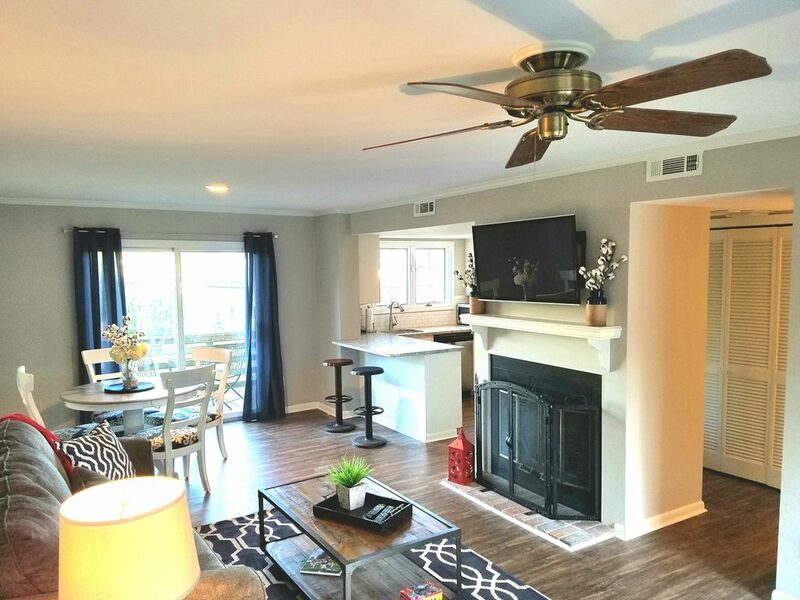 Everything in this 2 bedroom, 1.5 bath condo is brand new and ready for game weekends, double decker, graduation or just a weekend away! Renovated with you in mind, this charming condo has hardwood floors throughout, a large open living area with brand new sleeper sofa and big screen tv, an open concept kitchen with granite and stainless steel appliances and a half bath on the first floor. Upstairs you will find two nicely appointed bedrooms (Queen, 2 twins) with new beds and luxury bedding, along with a renovated full bath. This condo will comfortably sleep 6 people, but best of all it is a short (.7 mile) walk to all the shops and restaurants on The Square as well as being convenient to everything in and around Oxford. Cable tv and wi-fi are provided. It is all new and ready for upcoming weekends. The only thing left is you! We will include an additional night free on the front/back end of your trip if requested. My husband is an Ole Miss Law School grad. I am a proud alumni by marriage! We have one child attending Ole Miss now. We love having a place to stay that allows us to walk to the square for dinner and visit whenever we choose. We hope that anyone staying in our condo will enjoy the area as much as we do! The location, the condo itself, and Oxford, Mississippi. A winning combination and I simply can't say enough wonderful things about our stay and the wonderful accommodation that this house was for my first return trip to my alma mater in two years. This “Hotty Toddy” condo is in the perfect location. It is nicely appointed and has a cute deck. The bedrooms were cute and the beds are very comfortable! The only negative is that the stairs are very steep and there is not handrail, but we were able to manage after a cocktail! :). We will definitely stay here again!!!!! Easy and convenient location to all things Oxford! We came to visit my daughter and attend a game at Ole Miss. Perfectly situated to the square (though the first bit of the walk is straight up a massive hill), and away from the traffic on Jackson Ave, yet close to it all. Everything was clean and well kept. There were even fresh flowers on the table. The kitchen was well stocked with pots, pans, and dishes. The coffee pot was only a 5 cup, but it did have a gold filter so I didn't have to purchase any. It was all very functional. We even used the grill on the back deck. A few things that would have been nice, but in no way take away from the overall condo: a light on the back deck, a hand mixer for whipping potatoes :) Definitely will stay here again if I need a place in Oxford. We are so happy you enjoyed the condo. Thank you for your feedback and we will certain check out the light on the back deck. We had a wonderful stay! Everything we needed, great location, excellent communication, and sweetly decorated. The fresh flowers on the table were such a nice touch of hospitality! Perfect VRBO for a visit to Oxford. Perfect place for a quick visit. Everything we needed. Very clean and relaxing. We had such a wonderful stay for Ole Miss graduation, thank you for having us in your beautiful home! The location is so convenient for visiting the square and Ole Miss campus and having parking available is such a bonus. Your home is decorated beautifully and our family instantly felt at home. The downstairs has a great open floor plan, so we picked up some appetizers and had friends over to visit. Having a full washer and dryer is so nice, even though we were not there long enough to need it. We cannot wait to book a football weekend and visit again. Thanks again! 2017 Ole Miss Football Weekends: We will include an additional night free on the front/back end of your trip if requested.